The average unheated pool temperature is 78 to 82 degrees for only 3 months per year. Heating your pool with gas, electricity or propane can be very expensive. 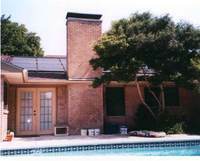 The best way to heat your pool and increase your swim season is with Free energy from the sun. 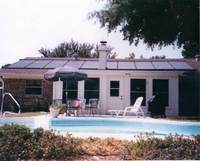 Sunrise Solar has been providing pool owners all over Texas with solar heating since 1991 and is recommended by most major pool builders. Sunrise Solar is the exclusive distributor of FAFCO products in Central Texas and is also a member of the Texas Renewable Energy Industries Assocation (TREIA), American Institute of Architects (AIA), and the Better Business Bureau (BBB). FREE heat for an (8) eight month or more swim season at 80+ degrees! Relaxed and Comfortable night and morning swimming! Added months of pool use for family fun and entertaining! 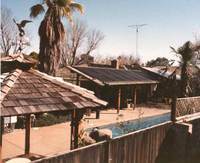 The ability to COOL your pool during the hot summer months! "Inherited" Sunrise Solar when we purchased our house in 2012, previous owners highly recommended them, and they have done a fine job, always very responsible and thorough. Dave has been putting up solar units longer than anyone else in Central Texas has been doing "anything" having to do with pools. He has dedicated his life to learning and perfecting his craft. If Dave puts in your system, you will have the best possible experience. It will work correctly and continue to be a benefit for years to come. thank you Dave. We love our solar heating on our pool. Sunrise is prompt to get us set up in the Spring and shut down in the fall. We highly recommend them! Installed our system when we had pool built. Really extends our swimming season. Works when needed to heat the pool in Spring and fall.